The IT ecosystem is just that: an ecosystem of interrelated mechanisms that need to work in unison to deliver services to the business. However, if most of the ecosystem evolves to help the organization become more adaptable and competitive, one unchanged layer can diminish some or all of the potential benefits. We are fast approaching that point with storage. 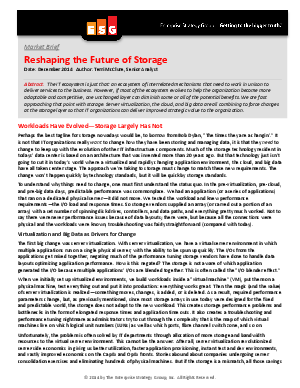 Server virtualization, the cloud, and big data are all combining to force changes at the storage layer so that IT organizations can deliver improved strategic value to the organization. Download this Market Brief from ESG today!